1. Competitors must be pre-registered. 2. 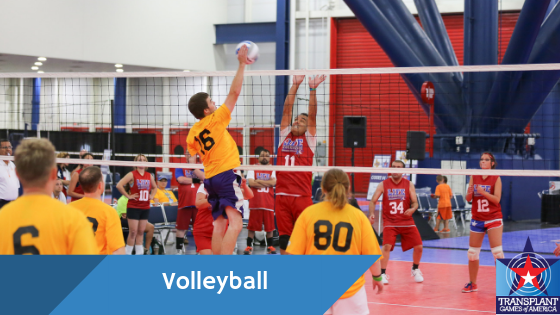 Teams may NOT submit competitors that are not pre-registered for volleyball. 3. All team members must be from the same “State Team.” For example, a Team Michigan player may not join with Team Utah/Idaho. 4. Only transplant recipients are allowed to participate. 5. Team Managers are required to assemble their rosters and turn into the TGA staff after competitor registration closes. Competitors must submit team names at check-in. Once brackets are drawn, the first round will be played as a round-robin, where each team in a group plays against each other team in the group. The top team(s) in each group will then progress to the bracketed playoff round, which will be created by the Tournament Director depending on time allowance. The first round will be games of two sets to 25; rally scoring, win by two points or first team to 27. Ties between teams are broken by considering the scores of the sets. The team with the best ratio of points scored divided by points lost is the winner. The bracketed playoff round will be the best two of three games, games to 25 points, rally scoring, win by 2 or first team to 27. Third game, if needed, to 15 points. Medals will be awarded to the first place team, second place team, and third place team. 1. Competitor/team check-in will be at 5:00pm on competition day. 2. Brackets will be drawn for pool play after registration and check-in; competition will commence no later than one hour after check-in. 3. All teams are required to provide a scorekeeper and a line judge. 5. State Teams are guranteed one team and allowed a maximum of two teams if space is available. 6. Six players are required to start to competition, with at least one woman on the court at the beginning of play. 7. A team may continue with four players if no other eligible players are available due to injury. 8. Teams may choose to use a libero to replace a player in the back row. 9. The libero is required to wear a different colored shirt. 10. Up to six substitutions allowed per game, but none after a team has scored 20 points. 11. Due to the limited number of possible entries, each team in the games will be allowed on volleyball team entry. Additional volleyball entries will be based on overall team size. 12. The set net height will be 7’4”. 13. Tachikara and Wilson will be the balls of choice. 14. Jersey numbers are required. The United States Volleyball Association rules will apply (www.usavolleyball.org) With some modifications. Once an event is completed and results are available, volleyball staff must record all competitors and scores to the appropriate system/documents. When electronic scoring is being utilized a manual backup system must be in place to record results.